Happy Christmas Eve Eve! I hope you all have a wonderful and blessed Christmas Eve & Christmas. I'm actually typing this on Friday, and scheduling it to post on Saturday. That way, I can spend the rest of the Christmas season with my family. I hope you all get to do the same! Today is also Short & Sweet Saturday time! Since I'm sure you're all done making Christmas cards, I decided to make my first card with a Sale-A-Bration item. 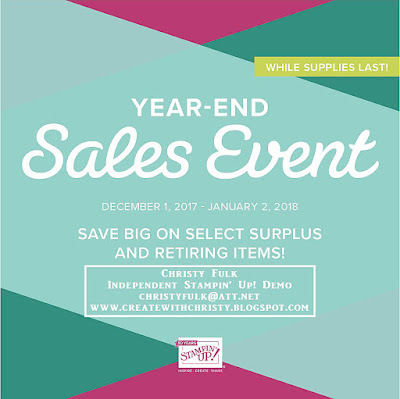 The stamp set I used is called Lots of Lavender, and it's one of the Sale-A-Bration stamp sets you can get free with a $50 order (before shipping & tax) starting January 3, 2018. I love the coloring options with this set. This time, I decided to use the stamps in the set to color in the image. Yes, there's a stamp to color the flowers, the leaves, the bow, and the stems! It's a photopolymer set, so it's very easy to line-up. I love the look. The greeting I used is from a new Occasions Catalog stamp set called Petal Palette, and it'll be available to purchase on January 3, 2018, too. I also used the wonderful new Tutti-Frutti Adhesive-Backed Sequins from the Occasions Catalog. They are my customer online thank you gift for December. 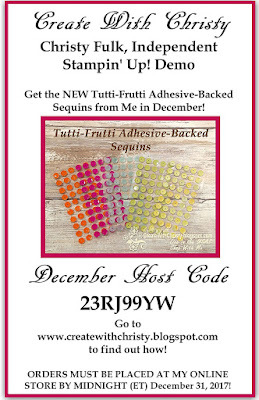 If you place at least a $75 order (before shipping & tax) AND use the December Host Code 23RJ99YW at my online store, you'll get these sequins free in the middle-part of January (separate from your order). CLICK HERE to find out all of the particulars...including when NOT to use the host code. You'll also see the card I'm sending everyone that places any sized order that uses the Host Code 23RJ99YW. You'll need to hurry though! This offer ends on December 31 @ midnight (ET)! Emboss the Powder Pink piece by running it through the Big Shot with the Layered Leaves Dynamic Textured Impressions Embossing Folder. With the longer sides of the Powder Pink piece on the top and bottom, attach the Petal Passion DSP strip across the top part of the piece. Fold the Fresh Fig piece in half (fold on top) to form the card base. Attach the Powder Pink piece to the card base. Stamp the lavender outline stamp from the Lots of Lavender Stamp Set onto the center of the large Whisper White piece using the Tuxedo Black Memento Pad. 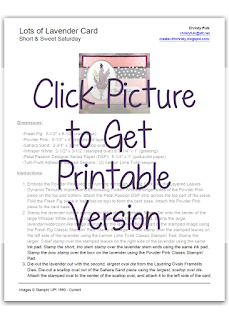 Stamp the large, lavendar/watercolor-like image stamp over the lavender flower part of the stamped image using the Fresh Fig Classic Stampin' Pad. Stamp the larger, 4-leaf stamp over the stamped leaves on the left side of the lavender using the Lemon Lime Twist Classic Stampin' Pad. Stamp the larger, 2-leaf stamp over the stamped leaves on the right side of the lavendar using the same ink pad. Stamp the short, trio stem stamp over the lavendar stem ends using the same ink pad. Stamp the bow stamp over the bow on the lavender using the Powder Pink Classic Stampin' Pad. Die-cut the lavender out with the second, largest oval die from the Layering Ovals Framelits Dies. Die-cut a scallop oval out of the Sahara Sand piece using the largest, scallop oval die. Attach the stamped oval to the center of the scallop oval, and attach it to the left side of the card. Stamp the "Best Wishes" stamp from the Petal Palette Stamp Set onto the center of the small Whisper White piece using the Memento Pad. Die-cut it out with the long, label die from the Petals & More Thinlits Dies. Attach a Lemon Lime Twist sequin from the Tutti-Frutti Adhesive-Backed Sequins onto each end of the label. 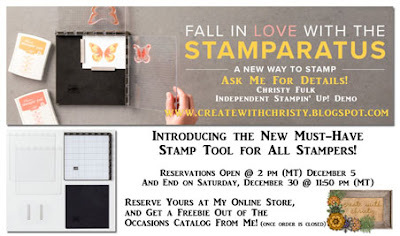 Attach the greeting label to the bottom, right of the card using Stampin' Dimensionals (see picture). Note: Attach everything using SNAIL Adhesive, unless stated otherwise. The Lots Of Lavender Stamp Set is a Sale-A-Bration item, and you can get it FREE by placing a $50 order (before shipping & tax) beginning January 3, 2018. The Petal Palette bundles (stamp set & dies), Petal Passion DSP, and Tutti-Frutti Sequins will be available to purchase beginning January 3, 2018.